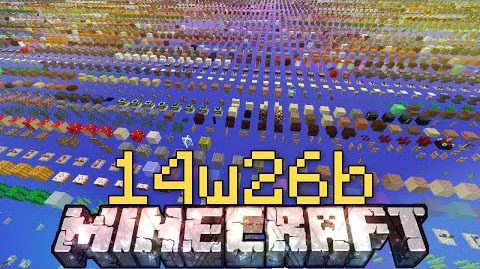 Update: Snapshot 14w26b has been released to fix some chunk loading issues. Many bug fixes and some performance optimizations. Blocks no longer talk about you behind your back. Flame-enchanted bows don’t activate TNT minecarts! Guardian doesn’t die on land and can swim in lava. Wearing Pumpkins on your head. Pumpkins are huge and upside down. The player no longer sinks into the first layer of stacked snow. The barrier blocks particles for being broken are purple and black checkered. To get snapshots, open your launcher and press the ?New Profile? button. Call it ?snapshots? and check the box saying ?Enable experimental development snapshots? and save. To switch to the normal version, you can select it in the dropdown at the bottom left corner of the launcher. Back up your world first or run the game on in a different folder (See the ?new profile? dialog).